Your biggest mistake was ending the process of unification with Europe. By not signing the agreement on December 19, you set the country back by decades. The work of thousands of intelligent and decent people went down the drain because of you. At least think about your own interests, if you won’t think of the interests of the state. You will never succeed playing Europe and Russia against each other, as you hoped. Because they know you and your natural abilities well on both sides. Every step, every action you take in a direction away from Europe weakens you, as president, and Ukraine, as a state. It’s no secret that for some, a weak Ukrainian president is the best partner. And so far, unfortunately, you meet this quality perfectly. Even though I don’t understand why you need this. Realize that Ukraine’s future, Ukraine’s security and its interests, and yours as well, lie in the European plane. If you want to save at least some political face, return Ukraine to a European strategy of development. Thirdly, don’t consider giving up the gas transport system. This is our last strategic resources. They only accept you today because this system still belongs to Ukraine. After it’s lost, you won’t have any arguments in your favor, of the country’s favor. You gave away Sevastopol in exchange for cheap gas. But where is this cheap gas? Now you want to give away the gas transport system…what will you give up next year, Viktor Federovych? Take the example of Belarus or Moldova. As soon as they gave up their networks, they lost all their appeal. Friendship ended in a second, along with the cheap gas. Fourthly, stop the nepotism in politics. This always ends badly. Ask you friend – your predecessor – about this. Only in fairy tales does a father divide his property among his sons. One gets the house, another the cow, another the horse. But you’re the president of a whole state, not a farm. It’s clear that you got married back in Soviet times when the sign hung in the marriage registrar saying "A strong family means a strong state." But you’re holding on to this principle too strongly. And your family is already so strong that soon there will be nothing left of the state. People might still understand if you gave your son the best car in the world, in line with his profession. But not he National Bank, Ministry of Interior and tax service. When a country’s law enforcement and finances are run by a dentist, the whole country’s teeth hurt. Don’t try to build dynasties. Ukraine won’t accept it. The Ukrainian Kim Jong Il will be a miserable and vulnerable man. You don’t need it. Don’t humiliate and discredit your sons. Fifthly, don’t steal state assets so brutally, insolently and openly. It’s useless. Sooner or later you will have to return them. Recall Kryvorizhstal. The state isn’t your personal pantry. Power passes and ends. That’s its nature. You can be a president in exile, but you can’t be the owner of Ukrtelecom in exile. Sixthly, politicians aren’t always completely honest. But don’t tell outright lies. Everyone laughs when you claim that you don’t influence judges, police or prosecutors, that you’re fighting corruption, reading Chekhov. It’s such an outright lie, that it evokes scorn. People can tell when something is false, and they don’t forgive it. When you say such things, the people listening to you automatically break out in nervous laughter. A president can’t allow himself to be funny. In 2009 I met one unusual politician. This was a person will full confidence. He had a confidence rating of nearly one hundred percent in his country. Every day his people bowed to him, believe that he was sent to them by a higher power. He planned to rule forever and nothing eclipsed his absolute autocratic power. He divided the whole country among his sons and felt like the master of his land. But just two years later, his dead body was being dragged by yesterday’s loyalists through the dust of his hometown. And one of his sons offered two million dollars to escape from the country. Despite the "nature" of our relations, I would never wish you, Viktor Fedorovcyh, a similar fate. I honestly hope that you can go to Yenakyivo not the way the politician I mentioned when to Sirte. Everything is in your hands. At least right now. And so, when you’re raising your traditional "Harrogate" glass by the Christmas tree, think at least for a moment about the nature of your power, think about tragic mistakes, about the ones already made and the ones you still want to make. Analyze your failures before, not after, they’re made. Because after is too late. 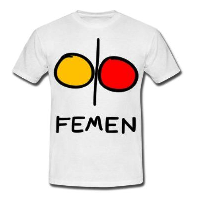 This entry was posted in NL and tagged blog on January 7, 2012 by FEMEN.